The treasurer for the National Democratic Congress (NDC), Alhaji Abdullah Ahmed Abdulla has accused its General Secretary, Johnson Asiedu Nketia of being a dictator. He said the party scribe has arrogated powers to himself and takes unilateral decision even after party events. 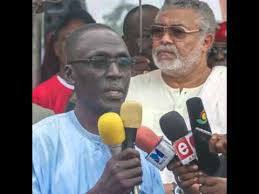 The conduct of Mr. Asiedu Nketia, Alhaji Abdullah noted has affected the party’s fortune. “Asiedu Nketia is very proud. He has given small children in the party a chance to speak to some of us anyhow. If we don’t take care they will destroy the party. “Asiedu Nketia is always quick to judge and always quick to spoil one’s name in the party when you disagree with decisions he takes. He has even taken the position of the chairman and so everything he says is final” he said on Asempa FM’s Ekosii Sen Wednesday. Asked if he will vote for Asiedu Nketia during their upcoming primaries, he said: “If they bring losers in the elections, they will continue to lose”. This notwithstanding, he said he has no regrets being a member of the NDC. “I joined the party because the love I have for the party and Jerry John Rawlings and there is no way I have regrets regardless of the attitude of the leadership” he noted.